There is a cup from which everyone must drink in turn. When your turn comes, do not sigh. Drink it happily, for it is your turn to drink. Who sits lonely and grieves over days now past. Before the glass smashes into a rock. Why do you grieve over existence, my friend? Why do you afflict your heart and soul with futile thoughts? Live joyfully and spend your life happily in the world. They did not consult you in the beginning anyway. Some people are thoughtful about religion. Others are suspicious of any conviction. I have solved all the major problems of being. I untied many difficult knots, using many tricks. Every knot I’ve opened, except the knot of death. and is considered to be among the greatest of all the world’s poets. 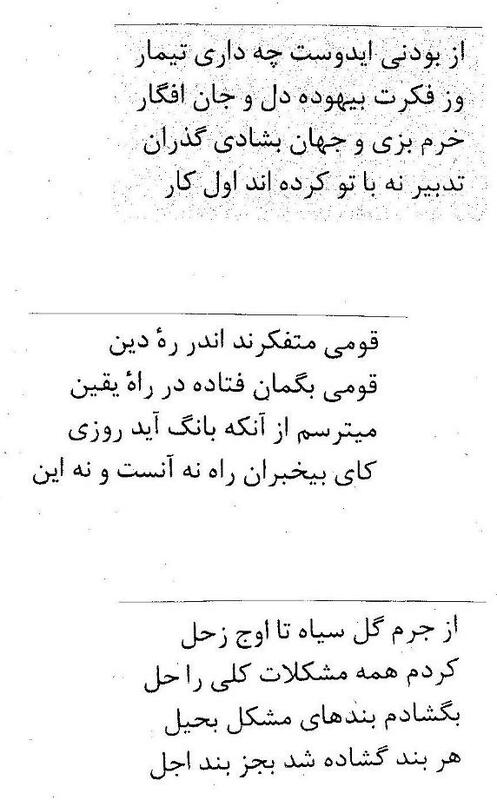 have been done with a simple, pleasing clarity by Reza Saberi.